Reading and motivation can go together like peaches and cream or be as poles apart as chalk and cheese. To enjoy a good inspirational book is to reach deep inside and touch the very heart of who we are. Conversely, wading through a book because it is required reading achieves very little. We are not motivated by chores and the only inspiration it achieves is the desire to pacify the boss or to get to the end of it! The great benefit of reading and motivation is that we can do it at our own pace. We can stop and savor meaningful sections, make reference to them by underlining, even make notes in the margin our journal. The many advantages of leisure reading include more intense focus on points and issues most meaningful to you, and to be able to re-read it and go back again and again. The more you savor and enjoy what you read the greater the effect it will have. Most books dealing with reading and motivation boast a secret. The secret of success, the secret of personal magnetism, the secret of a perfect memory, etc., and those secrets do, I am sure, hold the truth of that success. But there is one secret above all you should understand if you are to find advantage in any motivational reading and that is to have a genuine desire to achieve the goals or improvements you seek. The key to all achievement is ACTION– in physically doing. How to do it and when, can be learned from a teacher or from books but all the books in the world or the very best of teachers can only tell or show you how, they can’t give you skill and mastery over your subject. You alone must achieve that. Instruction can lead in the right direction with but only one thing can give you that skill you require, and that is action. You must get up, get out, and do it for yourself. That said, when you read about things that you are interested in the level of motivation naturally increases and we achieve a win-win situation. Golfers reading about golf literally devour every word, they identify with every tip or snippet of advice. 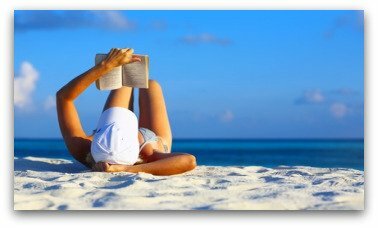 Sailors reading about cruising in the Caribbean under the sun and with the taste of sea salt on their lips are motivated! Many years ago my first publisher told me to “motivate your reader to sail the oceans and achieve their goals. If you have done your job, they will be happy with your book, Very few will actually get out and do it, but you will have fulfilled your task.” Are you going to be one of those couch sailors? Or are you going to make it happen for you? It’s amazing just how powerful words can be and how subconsciously affected we are by them. I was flicking through the TV channels when I stumbled on a program about losing weight. I wondered why I had not noticed it before. Then I noticed the title of the program, ‘The Biggest Loser’. I have spent years programming my mind to avoid loser’s and negativity it’s little wonder it never even occurred to me to watch it. If reading for you is a chore or something that must be tackled and competed as quickly as possible, then you are denying yourself one of life’s great delights. Some are able to skim through a book really fast and that is fine if you want only the ‘gist’ of what the author has to say. If you want maximum information, absorption of the written word is necessary and should be undertaken more methodically. For example, if you attend an instructional talk or lecture it is standard practice for the speaker to first introduce the topics and areas to be covered, state the broad concept or the bare bones of the talk. Then he will return to the beginning and talk about each stage or topic in turn and delve deeper. Reading can be approached in a similar way, first peeling through the chapter headings and delving where you are drawn. Then returning the beginning to begin the experience the author has to offer. Moving along stage by stage, taking time to think, to analyze and digest. Another way the serious reader can approach a book of this type. Read it through to begin with to understand what the author is dealing with. Then return to the beginning. The method I use works very well, I keep a marker pen by me whilst I read, then each time I come across a passage I may wish to refer back to, I mark it. This provides a quick and easy reference, although it does mess up the book for anyone else! I consider motivational books as my tools, and I use them as such. An alternative is to buy two books; one to mark the other to keep untouched. Of course it would be inappropriate to mark a book that did not belong to you but then, as I have already said, I like to own the books I read. Another point is that as you develop and stretch so your understanding and viewpoint change. So I find it invaluable to re-read the book, again and again, and each time I find something new and often it is unmarked and new to me. After all, as I have said before, if you are not already rich and successful then there is still something ‘not quite right’ with your technique, something that needs changing and it is by forming new habits and repeated reference to the instructional material that will ensure it. How does a concert pianist become so accomplished? By constant practice and a deep desire to achieve the goal: ACTION is the simple answer. He may be able to read the music and play the score on sight very quickly, but to reproduce the magic and interpret it as the composer intended, the musician needs to study, practice and understand. Just like you. You have all the requirements, so just add ACTION and you will be the maestro of your own success. READING AND MOTIVATION + ACTION CREATE RESULTS.